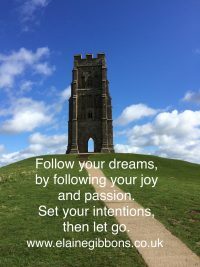 By choosing to follow your joy and passion, you are responding to your intuitive nudges to live the life of your dreams. But courage is necessary. We don’t live in a society that encourages us to follow our dreams, to enjoy our lives, to live passionately and with motivation. However, this is how we can live our lives if we are brave enough to listen to our inner guidance. The things in our lives that fill us with joy and passion are showing us the actions we need to take to enable us to follow our dreams. Life is too short to not be enjoyed. None of us know how long we have on this earth, so be brave. Start taking small steps and actions every day to take you closer to your dream life. Release the negativity that will definitely come up as you take this path. Your ego telling you that you aren’t good enough, you don’t deserve it, its impossible. Acknowledge it, respond with love and compassion and let these thoughts and feelings that no longer serve you go. Focus your energy and attention on your dreams and the direction you are heading in. Take just one small inspired action today, that takes you one step closer to the life that you want to be living.